Do not tug at the foreign yoke together with unbelievers, [but] leave their company and separate yourselves, says the Lord. I handed over these present booklets or writings to the press several years ago at the request of a godly preacher,1 and at that time many of them were sent to Pressburg2 and to my fatherland in Salzburg through a good friend. Eventually my work even found its way among the Catholic priests, who immediately had at it and refuted it with cunning arguments. But they truly did so on such weak grounds that I do not consider it necessary to refute their arguments once again, for right must always be right, and all pious hearts will adhere to it (Psalm 94:15). I for my part simply count myself most fortunate and continue to thank them for the fact that they have assigned me a praiseworthy name by calling me a disciple or follower of Luther, even though I do not consider myself worthy of being compared to Luther—precious, blessed man that he is. Now although my first booklet was attacked rather harshly by those papist gentlemen, by the grace of God it still had a very beneficial effect within the papacy and opened the eyes of many simple people. For I have reliable testimony from certain persons in which they themselves have acknowledged that after they read through my simple writings, their conscience was so awakened that they immediately abandoned the papistic religion together with their fatherland and voluntarily declared their allegiance to the doctrine of the pure evangelical faith. So too many pious hearts still come to me daily and ask if they can purchase my booklets. But since none of them were available anymore, other God-loving Christians have now been found who have financed their reprinting and handed them over to the press, so that the admiring reader can now have all my writings together in one volume. Now on my part, I wish from the bottom of my heart that it may please God the heavenly Father to bless the kind intentions of these God-loving persons and to have this simple, modest little work be directed solely and only to the honor of his holy name, so that it may not leave without bearing fruit among pious and Christian hearts. And may he himself, the God who abounds in love, be pleased in the meantime to enlighten the erring, to comfort the persecuted, and to bring back those who have been led astray, while graciously preserving us in the pure truth of the evangelical faith until our blessed end, through our Lord Jesus Christ. Amen! Amen! Joseph Schaitberger, Neu-vermehrter Evangelischer Send-Brieff/ Darinnen zwei und zwantzig nützliche Büchlein enthalten/ Geschrieben an die Lands-Leut in Saltzburg und andere gute Freund/ dadurch dieselbige zur Christlichen Beständigkeit/ in der Evangelischen Glaubens-Lehr/ Augspurgischer Confession/ in ihrem Gewissen/ aufgemuntert werden/ Aus Heiliger Göttlicher Schrifft zusammen getragen/ und auf Begehren guter Freund zum andern mahl in Druck übergeben [Newly Enlarged Evangelical Circular, Containing Twenty-Two Valuable Booklets, Written to Countrymen in Salzburg and Other Good Friends, Through Which Their Consciences Are Encouraged to Christian Perseverance in the Evangelical Doctrine of the Augsburg Confession, Put Together on the Basis of Holy, Divine Scripture, and Handed Over for Print for the Second Time at the Desire of Good Friends] (Schwabach: Moritz Hagen, and Nürnberg: Widows of Johann Hoffmann and Engelbert Strecken, 1710). 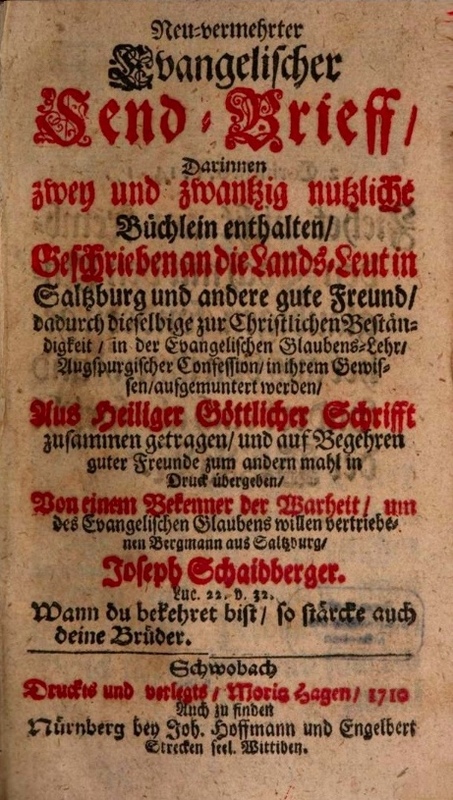 1 There is an book titled Evangelischer Send-Brief Samt noch etlich andern Unterricht- Vermahnungs- und Trost- Schrifften an seine liebe Lands-Leute in Salzburg und Tefferecker Thal that appeared in print in 1702. Other sources say that these booklets already began appearing in print individually in 1688. The “godly preacher” to whom Schaitberger refers is Andreas Unglenck, pastor at St. Jakob in Nuremberg who died in that city in 1697. Red Brick Parsonage is operated by a confessional Lutheran pastor serving in the South of the U.S.A.